DSS-M15 is a heavy-duty metal gear standard servo with 180°wide angle, high torque power, improved stability and durability. 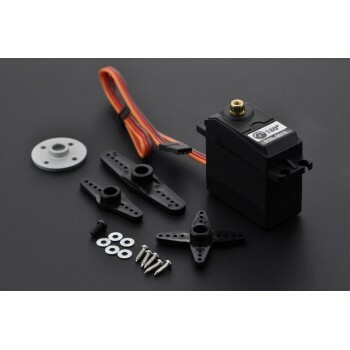 Able to take in 6V and deliver a strong torque power of over 15Kg, this tough 180°servo will never let you down when you need it. Tested with high load capacity for 12 hours long, this DSS-M15 servo demonstrates a maximum torque of 18Kg without much vibration or heat. In addition, we enclose carefully selected steering parts, including an aluminum alloy wheel and a long bracket, to enhance servo performance.